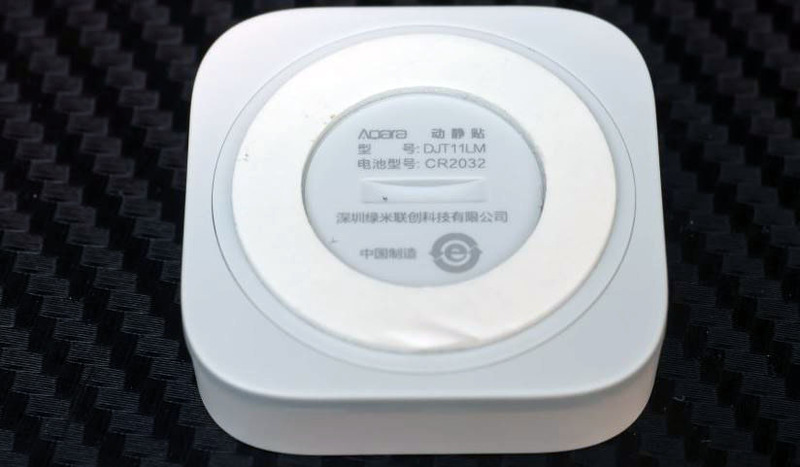 The sensor works using ZigBee protocol, It is powered by CR2032 element and has size of 36 * 36 * 9 mm. In addition to the sensor, there is an extra sticker of the double-sided adhesive tape and multylingual instruction. 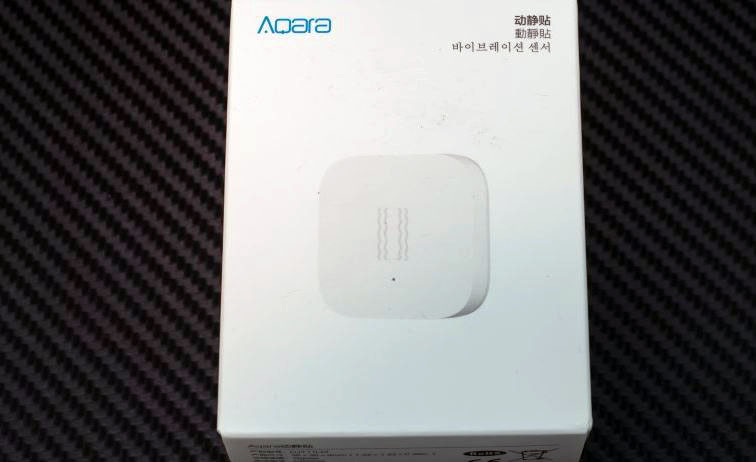 The sensor has a traditional Aqara square shape and appearance. 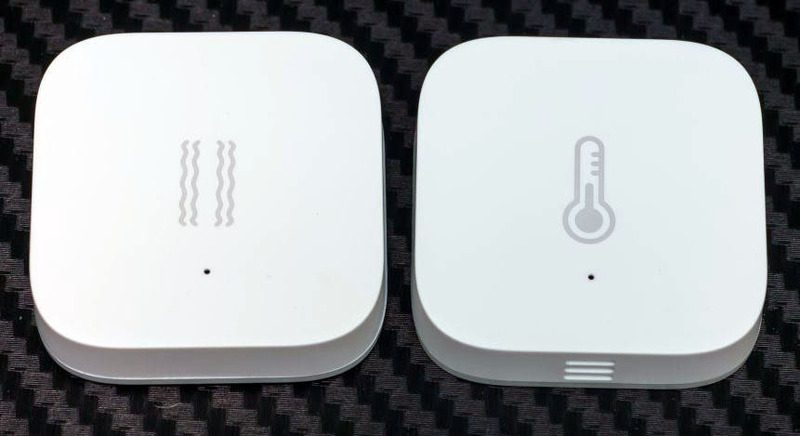 Moreover, it is exactly the same as the temperature/humidity/pressure sensor, excluding the labeling and the absence of hole for measuring the relative humidity of the air. There is a label in the form of two wavy lines and a blue LED on the front surface of the device . On the upper end of the sensor there is a pairing button with the gateway. 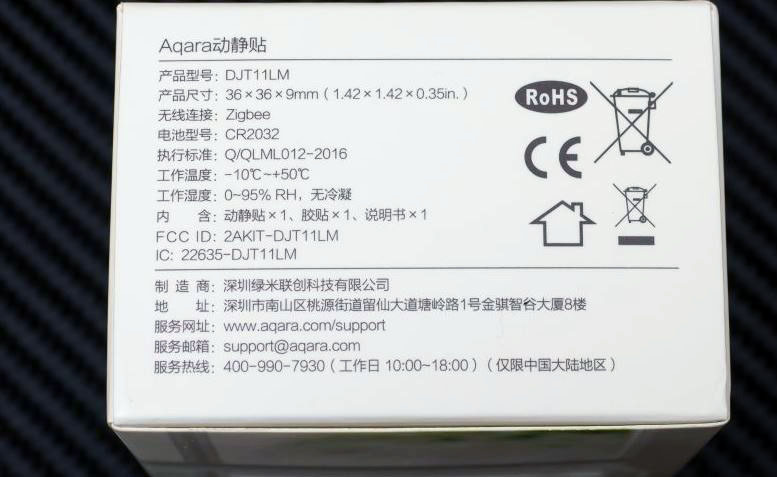 At the back, there is a cover with a double-sided adhesive tape, under which there is a 3-volt CR2032 battery. 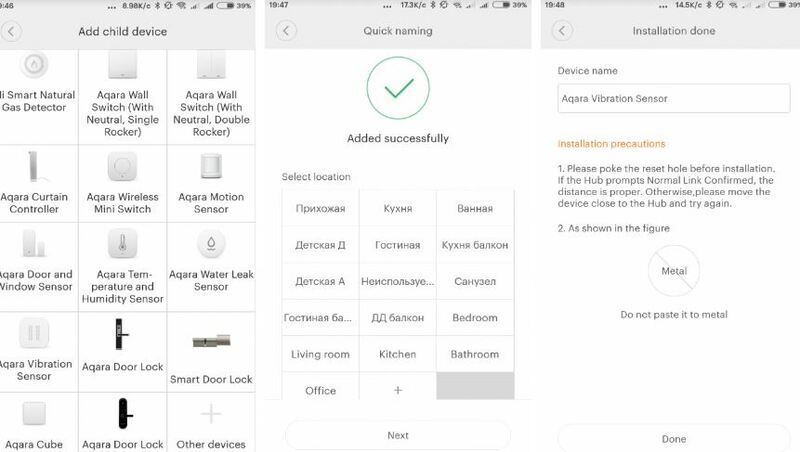 The sensor is connected in the MiHome application directly or through the gateway plug-in. Gateway, Aqara and Mijia – it does not matter. The sensor has standard wizard – select the desired sensor from the list, press and hold the sensor button until 3 diode flashes appear,and select the room in which the sensor will be installed. The sensor plug-in has two standard windows – one of the window has a list of scenarios in which the sensor is involved, the second one has a trigger log. All other things are in the menu. 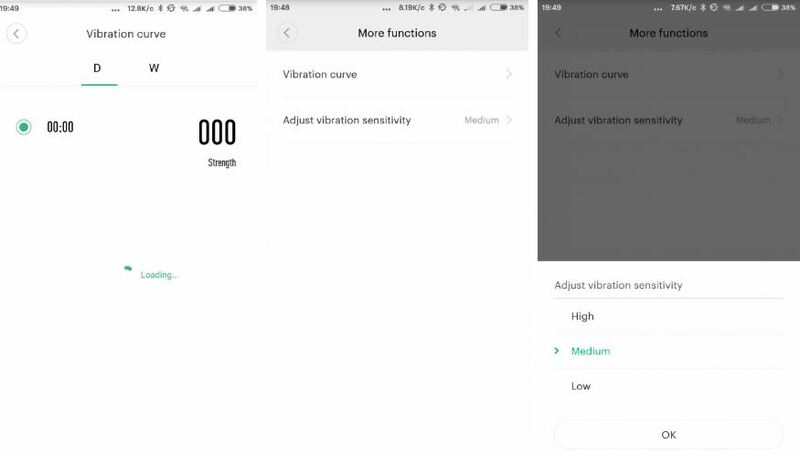 Regarding the exclusive information, the sensor menu can provide for the statistical vibration curve data, the data appear not to be updated by day and by week yet, so I do not understand their meaning. There is also an adjustable sensitivity level, the default sensitivity level is medium. 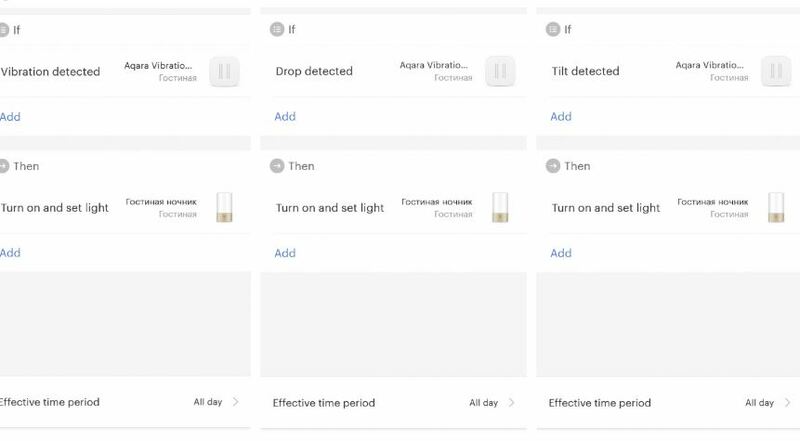 If you need to change it – it’s better to select it experimentally depending on the tasks, then after selecting the level, you need to press the button on the sensor and get a voice confirmation from the gateway. The sensor definitely can only be used as a scenario condition. It offers three options of the impact – detection of the vibration, the drop and the tilt. 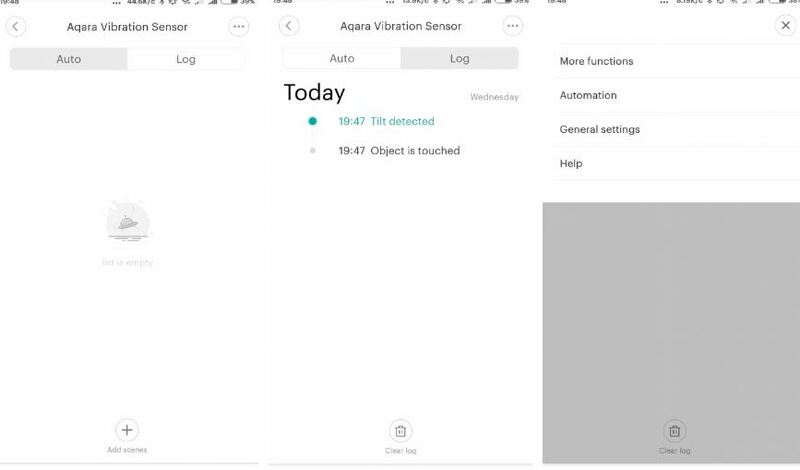 Accordingly, these actions are displayed in the logs as Object is touched, Object drops and Tilt detected. I experimentally established that the first action – the detection of the vibration, can not occur more than once per minute, the second and the third action occur as the action is committed. What do all these actions mean? 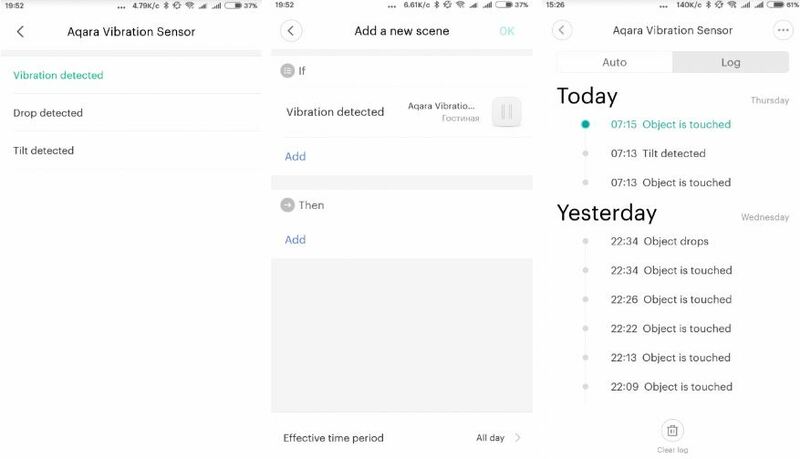 The action of the vibration detection is generated, as I’ve said, not more than once per minute, it needs, as the name implies, the impact of the vibration. For example, the sensor is in the cabinet, in which you close the doors that caused the vibration. Or the device is on an object that has been moved, or it is on the safe the door of which has been opened and closed, or the sensor may be installed on a chair on which you have sat down, etc. The drop event is generated when moving like a drop or a throw. Options for the use are- to monitor the falling of some objects, or for example the sharp closing of covers. The tilt, or rather say an offset, is the action that will be generated when the sensor is fixed to a door or awindow and that will move. Unlike the opening sensor – which generates the statuses – open or closed, the vibration sensor generates the movement of a window or a door, it can be useful in cases where the door does not close, or it is a sliding or a rotating one.